The Industrial Control Technology unit (ICT4) is a representation of an industrial assembly system that allows the study of control methods used in product assembly and inspection as in a manufacturing process. Industrial sensors of various types are used and the methods, in which they can be applied are studied. The Sensors and actuators are used to sort components, assemble them and test for correct assembly followed by acceptance or rejection. 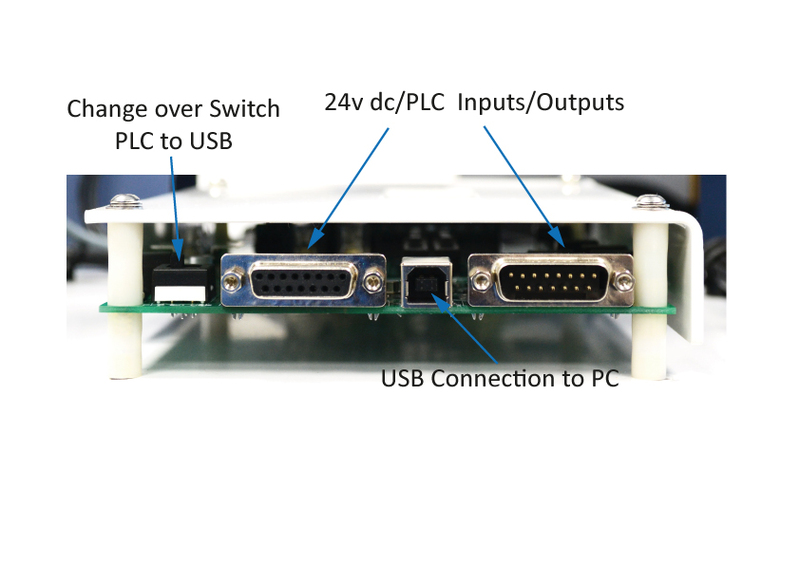 The unit can be controlled from a PLC using the 24v dc on board connections or from a PC thru the USB on board connection. The unit assembles two components a plastic ring and an aluminium peg. 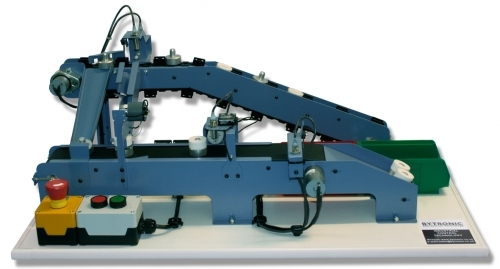 A chain conveyor processes the components through the sort area; the plastic rings and aluminium pegs proceed down a ring and peg chute and are then assembled on the belt conveyor. At the assembly check area components are inspected for correct assembly and when the components reach the final area, if correctly assembled they proceed to the acceptance area, faulty assemblies are rejected into a reject bin. Correct programing of the controller (PLC or PC) must be achieved to ensure scrap components are not sent to the final assembly area. Once the program has been written and the system is working correctly, various faults can be applied using the fault insertions switches, providing diagnostic solving issues. LED’s on the sensors provide a visual indication of the operational status of the sensors. The sort and reject solenoids are fitted with sensors to monitor the operation of the solenoids and to ensure the operation has been correctly performed. Sample I/O code for ©Microsoft VB.NET, C#.NET, and ©Delphi are supplied and additional code is available from the FTDI website: www.ftdichip.com/Support/SoftwareExamples/CodeExamples.htm for the users to write their own program. The ICT4 can also be controlled using LADSIM4.